Costello’s Jewelry Company of Chicago provides a full range of jewelry services including jewelry and watch repair or appraisal, and restringing of pearls. The craftsmen at Costello’s are GIA graduate gemologists and tenured in the jewelry business. So what’s so exciting about Costello Jewelry Company of Chicago that makes your engagement ring shopping a little more special… Costello’s care of their “beloved Chicago area customers” is just like being treated like royalty. This distinction is why Coast Diamond is proud to call Costello’s Jewelry Company Retailer of the Week. You should be treated like royalty when you shop for your dream engagement ring. Your engagement ring is the crown that represents the love you share. At Costello’s you will get the royal treatment and with Coast Diamond’s graceful and stylish designs you will find your crown. What Crown Best Represents Your Love? For the “look-at-me bride” crown her with ribbons of diamonds encircling a 1.25 to 1.75 carat diamond center stone and cascading down the shoulders of this stunning Coast Diamond rose gold engagement ring (LC5449RG). This ring is sure to get attention with the unique twist of diamonds that sparkle in every direction set in rose gold, which is the most popular metal in engagement ring trend today. For the “true romantic bride” a scalloped band of prong set diamonds is crowned by a 1.75 to 2.25 carat diamond center stone in this regal Coast Diamond engagement ring (LC10031) from the Coast Romance Collection. The large center stone is held in place with double prongs for security and the band is finished with milgrain edging. For the “not too simple bride” crown her with this classic Coast Diamond 1CT solitaire engagement ring (LC6054) that is embellished with petite fish tail set diamonds. The solitaire engagement ring style is still the most popular choice in engagement rings. 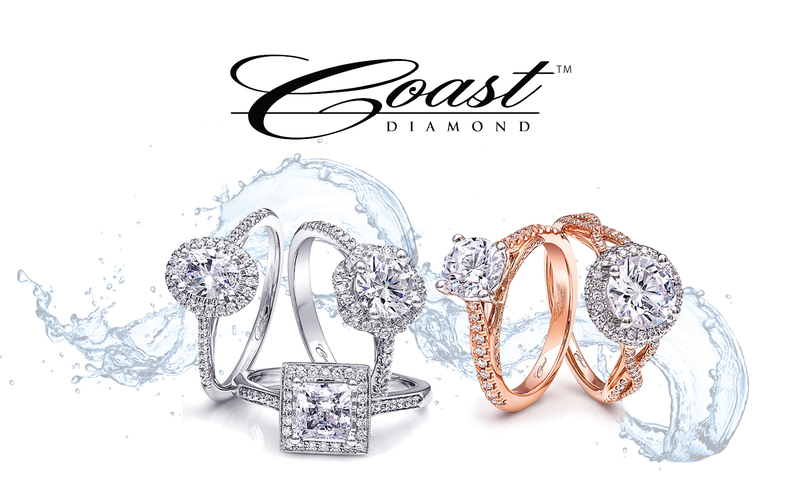 Congratulations to Costello’s Jewelry Company for being our Coast Diamond Retailer of the Week! For a couple in love an engagement marks the beginning of a lifetime together of dreams come true. Skatell’s Manufacturing Jewelers of Mt. Pleasant, SC understands the importance of finding an engagement ring that represents your dreams. It is their goal not just to sell you jewelry but to help you fulfill your dreams. Skatell’s Jewelers set this lofty goal in 1989 when they opened their doors as not just as a jewelry store, but a full service family owned manufacturing jewelry store, serving customers from start to finish without sending out your “dream” to be serviced by someone you don’t know. It takes great dedication and care to successfully serve customers as Skatell’s does and Coast Diamond is pleased to call them our Retailer of the Week. Your engagement ring is the first piece of jewelry that represents your relationship as a couple. Coast and Skatell’s share the commitment to provide couples in love engagement rings of the highest standards at the lowest possible prices. No couple wants to compromise… Because Skatell’s cuts out the middleman, you don’t have to. You can Mesmerize Her with the Coast Diamond engagement ring of your dreams. Coast Diamond refined cushion shaped halo engagement ring (LC5409) with 0.37CT of diamonds surrounding the halo and decorating the band. A matching band (WC5409) is the perfect finish or… a beautiful beginning of a bridal stack that is so popular in bridal jewelry today. Sure to stand the test of time the Coast Diamond round halo engagement ring (LC5448) is ideal for a 1CT center stone. Coast engagement rings are completely customizable for any shape or size center stone and any metal type, making each ring as unique as the person wearing it. This unique Coast Diamond engagement ring (LC10008) is created with two rows of diamonds that split to present the center stone. The matching band (WC10008) is contoured to fit perfectly with the engagement ring. Congratulations to Skatell’s Manufacturing Jewelers in Mt. Pleasant, SC for continually helping couples fulfill their engagement ring dreams, and for being our Coast Diamond Retailer of the Week! Huge personality – Daring – Fearless – Stands out from the crowd – Ahead of her time… If these things describe your bride-to-be, then she most definitely needs a bold and sophisticated Coast Diamond ring. If you need some help finding that perfect bold and sophisticated ring for your bride-to-be LaRog Brothers Jewelers in Portland, Oregon is where you need to go. LaRog Brothers has over a century of service to couples just like you who sparkle when they enter a room and stand out in a crowd. This is the third time Coast Diamond has celebrated LaRog Brothers as our featured retailer. We first featured them for their long-standing history in the fine jewelry business dating back to 1910. Our second feature of LaRog celebrated Portland couples and their fabulous Coast Diamond engagement ring picks. Today, we feature LaRog Brothers Jewelers as our Coast Diamond Retailer of the Week because they lead the way in bold and sophisticated engagement ring picks by Portland couples in love and we can’t help but get excited about that. This 1950’s watch box is a piece of LaRog history that would be very expensive to make today. Bold means lots of diamonds and you can’t beat this Coast Diamond double halo ring (LC10130) with a split band of diamonds to hug your finger and keep this beauty in place. A dazzling 1.25 carat center stone of your choice completes this ring to perfection. Whether you are looking for a stunning engagement or anniversary ring… This is it! Look no further for an engagement ring that is as sophisticated as your bride-to-be. This Coast Diamond classic six prong solitaire engagement ring (LC5250RG) is beyond gorgeous with mixed metals of white gold prongs and a rose gold band of diamonds. Finish it with a matching rose gold diamond band (WC5250RG) and she will be reminded of the warmth of your love every time she glances at it. Bold and sophisticated rolled into one, the Coast Diamond 2.3CT band (WZ5003H) with three rows of intricately set diamonds suits her sparkling personality to perfection. Such a gift will take her breath away on your anniversary. Congratulations LaRog Brothers in Portland, OR for being a leading Coast Diamond Authorized Retailer of bold and sophisticated Coast Diamond rings! The three E’s of engagement ring shopping are the most important elements a couple should consider of a jeweler when shopping for their engagement ring. Kubes Jewelers knows the three E’s are what makes them the most trusted place to shop for your engagement ring in Fort Worth, Tx. Experience – Kubes Jewelers has 70 years of experience in the jewelry industry. Education – The staff at Kubes Jewelers, consisting entirely of family, are GIA gemologist and diamond graduates. Expertise – Kubes Jewelers can offer the most competitive pricing in Fort Worth because of their experts in the jewelry industry; their expertise and education are passed on to couples for a confident diamond buying experience. This week Coast Diamond is pleased to call Kubes Jewelers of Fort Worth, TX our Retailer of the Week. The family tradition of trust, reliability and respect at Kubes Jewelers began with Joseph and Rita Kubes in 1945 and continues today with the fourth generation of the Kubes family. This stunning Coast Diamond cushion shaped halo engagement ring (LC5391RG) features a white gold halo with fine pave set diamonds, and a rose gold band decorated with pave diamonds. This striking Coast Diamond floral inspired halo engagement ring (LC6026RG) framed with rose gold milgrain edging and featuring a split band of fishtail set diamonds. This stackable Coast Diamond eternity band (LC2012A), of marquise shapes finished with milgrain edging, has a round brilliant diamond in the center of each segment. Whatever strikes your fancy in fine jewelry gifts (of course here at Coast we prefer diamonds) Kubes Jewelers can assist you today. Stop in for the Experience, Education and Expertise Kubes is proud to offer every couple in their engagement ring shopping.